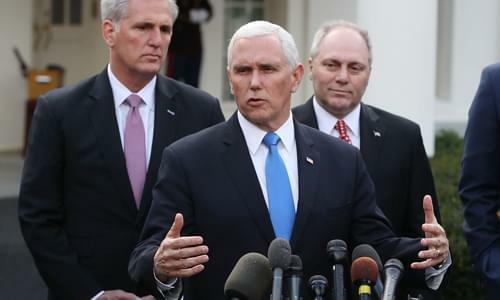 On Tuesday’s Mark Levin Show, Vice President Mike Pence calls in to reiterate the Trump Administration’s commitment to the humanitarian security crisis at our southern border, despite the Democrats’ unwillingness to negotiate. Pence suggested that all Americans call their members of Congress to urge them to fund and build the border wall. A steel barrier and reformed asylum laws will make the human traffickers and the cartels—who take cash to exploit vulnerable Central American families, — less convincing in enticing them long dangerous journey. Then, no excuses should be made for Congressman Steve King’s alleged comments (R-IA), but he’s not a Klansman dressed up as a Congressman. The New York Times should release the audio they claim to have of King’s statements for the people can hear for themselves. Moreover, the growing movement of anti-Semitism in the Democratic party continues. Former President Jimmy Carter, John Kerry, Keith Ellison, Louis Farrakhan, Al Sharpton, and new members of Congress Rashida Tlaib, Ilhan Omar, have all said things to eviscerate the Jewish state and Prime Minister Netanyahu. Yes, it’s important to condemn racism, and it’s equally important to condemn the growing anti-Semitism in the Democrat Party. Afterwards, the Supreme Court and the federal judiciary are destroying America and it’s a huge problem. Everything is up for grabs in this political process. As Associate Director of Presidential Personnel, Levin observed that district court judges are often bargained over with the opposing party often splitting the number of vacancies as part of a compromise. This was clearly the precursor to the gruesome Obamacare ruling using unelected judges to create the laws they couldn’t create legitimately in elected government. Networks Trashed Trump With 90% Negative Spin in 2018, But Did It Matter?